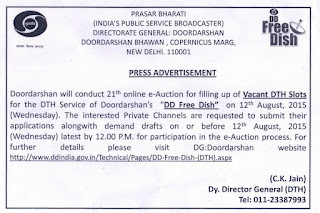 Doordarshan will conduct 21th online e-Auction for filling up of Vacant DTH Slots for the DTH Service of Doordarshan's "DD Freedish" on 12th August, 2015 on Wednesday. The interested Private Channels are requested to submit their applications along with demand drafts on or before 12th August, 2015, Wednesday latest by 12:00 PM. For Participation in the e-Auction process. 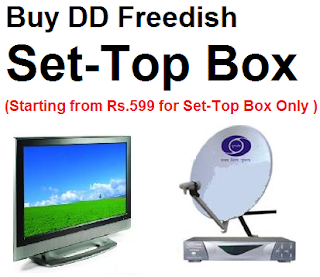 For further details of this e-auction please read Term & Conditions or visit official website. 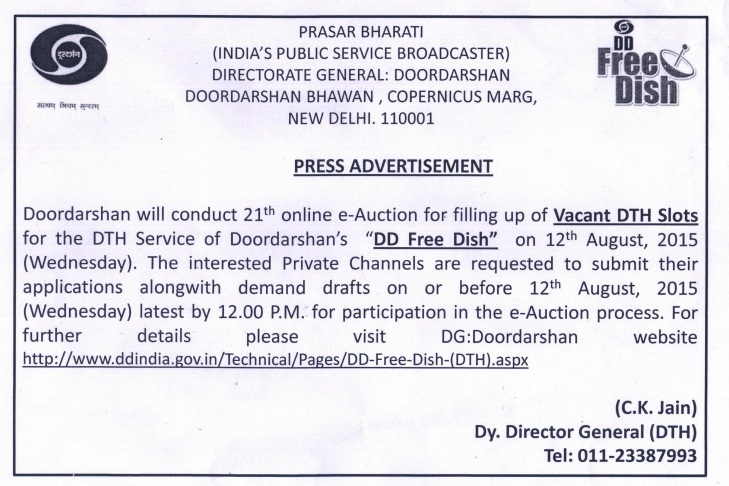 Noida-based C1 India Pvt Ltd will conduct the e-auction on behalf of Prasar Bharati. The applicants must provide their up-link/down-link permission documents received from the ministries concerned.